Comparing the scene last year at Cannes Lions, where the Jetée Albert Edouard was dominated by the AdTech flotilla, you would be forgiven for thinking that an iceberg had sunk the usual brigade of floating gin palaces before the festival this year. An iceberg of sorts has been forming in the world of AdTech, threatening the very foundations of online advertising. But this threat hails not from the icy fjords of Greenland, but from the parliament of the European Union. The GDPR – the first set of EU data regulations since the dotcom boom, threatens to put an end to not only the excessive ‘AdTech Bro’ party culture now synonymous with Cannes, but the entire industry whose AdTech businesses are built on wide-scale sharing of user data for the purposes of targeting. And for Cannes, the event once considered by top advertising execs as THE event to celebrate the creativity and resilience of the industry, has come to be seen as a sad reshuffling of deck chairs on board the Titanic for an industry that looks to be sinking, fast. Since the enforcement date back in May, ad exchanges have seen EU demand volumes plummet between 25-40% in some cases. We’ve already had some casualties with data-heavyweights like Verve and Drawbridge dumping their EU business overboard in a bid to avoid the costly fines associated with non-compliance. For the rest of us who have decided to weather the storm and deal with the complex requirements and variety of interpretations set out in the regulation, we’ve been left out at sea in uncharted territory that even our DPOs are struggling to navigate. But just as all hope seems lost for AdTech, a lifeboat appears in the distance. 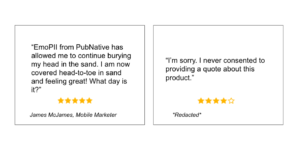 PubNative, the leading mobile monetization platform today announced the launch of EmoPII, a definitely-not-GDPR-compliant tool that helps advertisers to continue targeting the right audiences with relevant ads in the right place, at the right time. 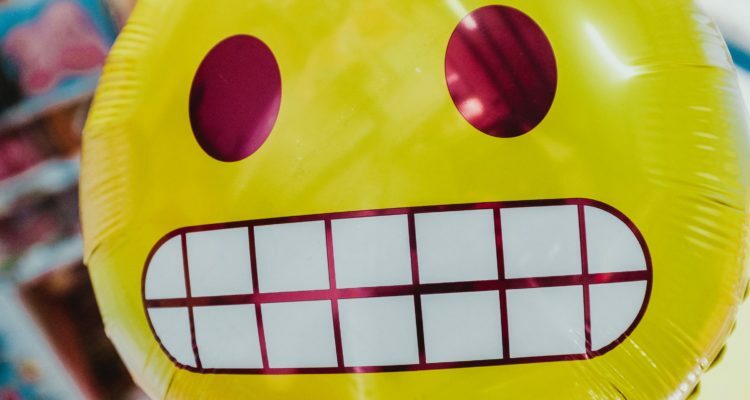 The Berlin-based company will allow its clients to leverage the questionable EmoPII technology to pass complex user-related emoji series instead of Device IDs in the bid stream. Information normally included within the bid stream which can be considered as PII (personally identifiable information) and is now restricted for use in most cases under GDPR, can include data such as the user’s demographic information, browsing history, and location – all of which are extremely valuable data points to advertisers building user profiles for targeting purposes. The user visits the publisher’s mobile app, triggering a bid request for a specific ad placement. Unique information relating to the user like IP address, device type, etc is contained within the request and made available by the publisher through an ad exchange. 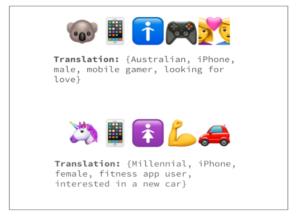 To circumvent the new, strict EU data regulations, PubNative’s EmoPII technology instead passes emojis relating to the specific user within the bid request. The shady workaround ensures advertisers and publishers alike can continue to generate high revenues from their EU users all the while burying their heads in the sand and refusing to accept the reality that users do not want to be tracked or targeted without their knowledge.